Illuminated Manuscript, Melk Missal, Crucifixion, Walters Art Museum Ms. W.33, fol. 132v, originally uploaded by Walters Art Museum Illuminated Manuscripts. 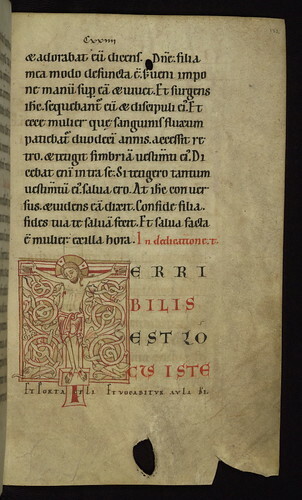 This missal, which dates to the late twelfth or early thirteenth century, was made for the Benedictine abbey of Melk or Seitenstetten in Upper Austria, as indicated by the inclusion of local saints and liturgy. The surviving volume of a multi-volume missal, the book contains only the "Summer Part," with the Temporal running from Holy Saturday through the Sunday after Trinity Sunday, and the Sanctoral beginning with the Nativity of St. John the Baptist and ending with St. Andrew. The manuscript lacks a calender, an element that was most likely included in one of the other volumes. Most notable about the manuscript are its skilled pen drawings, including two full-page miniatures depicting Christ in Majesty and the Crucifixion, as well as sixteen ornate initals, three of which are by the artist known as Gottschalk of Lambach. The binding, although later and dating to the fifteenth century, is also notable, for it contains inscriptions impressed with movable type.